I have visited LeatherFoot in Toronto, Canada twice in the past year, and each time the aspect I have liked most is the on-site tailoring workshop. So few shops have crafts on-site, even though it gives them a direct connection to the artisan. Indeed, few apart from Brio in Beijing have even an adjustments tailor (which is just plain efficient). 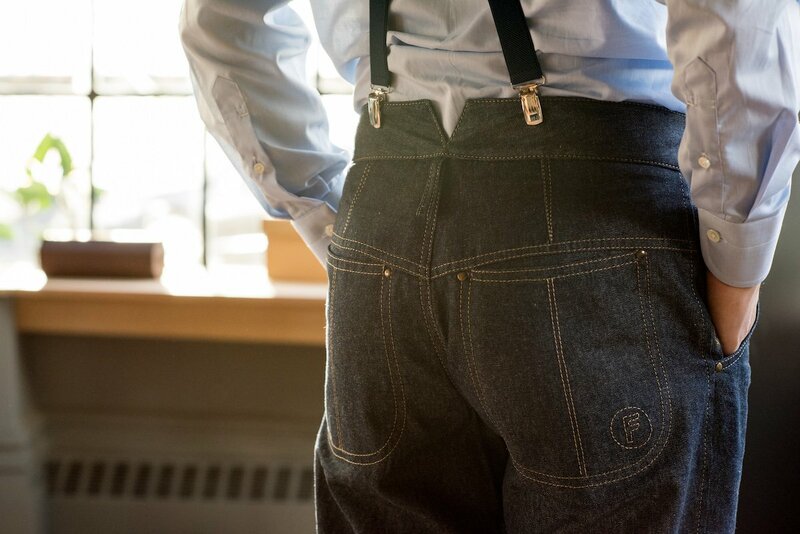 At LeatherFoot, bespoke feels integral to the shop because it is in the same building. 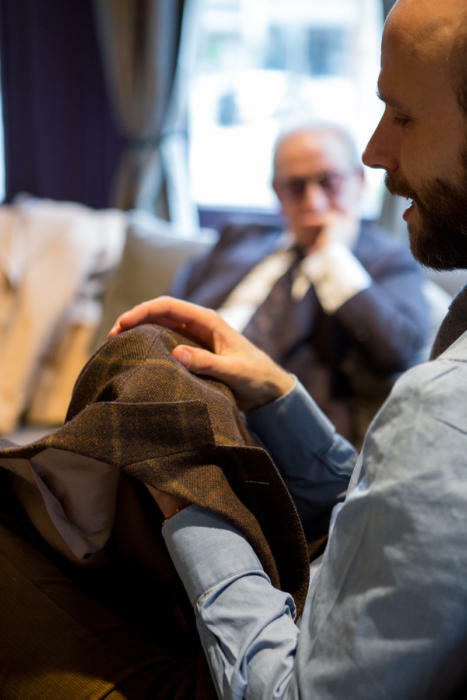 Customers can see and visit the tailor, Signor Francesco, and it enables LeatherFoot’s founder, Ideyi Chuku, to support the craft in a very concrete way. A regular customer of bespoke, Ideyi stumbled across Signor when he saw a display piece in a Toronto window. That led to a commission, and a relationship that enabled him to move the tailor into his newly expanded LeatherFoot emporium last year. 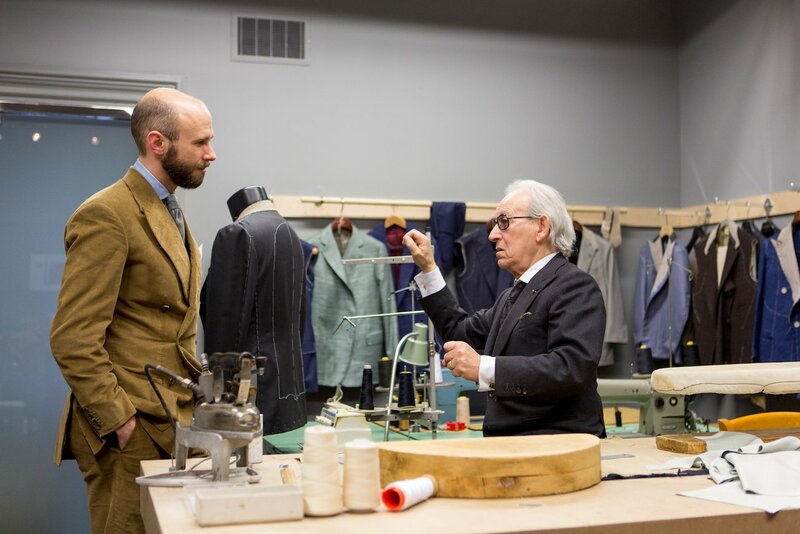 Signor began training as a tailor when he was 11. The seventh son in the family, it had the potential to be a solid career, and he worked for six years for various tailors in Palermo, Italy, before moving to Milan at 17. There he worked for Gaetano Paterniti, a well-known tailor in the city who made for the AC Milan football team, among others. Signor ended up marrying Paterniti’s daughter; the house itself got into trouble in the late 1960s, and eventually closed. Signor and his wife moved to Canada when he was in his 30s, despite speaking little English, and he initially worked for tailoring shops before creating his own shop in 1972. 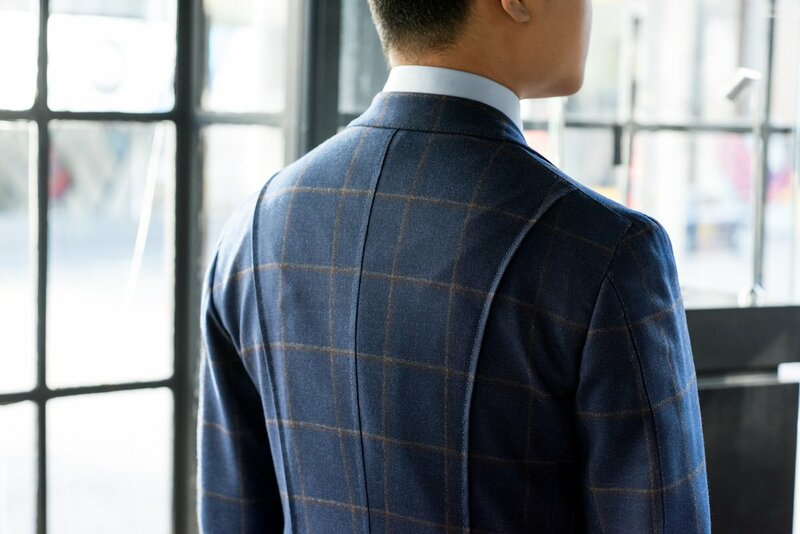 In the following decades Signor largely stuck to his bespoke principles as other tailors increasingly added fusing to their suits, and cut from more standard patterns. 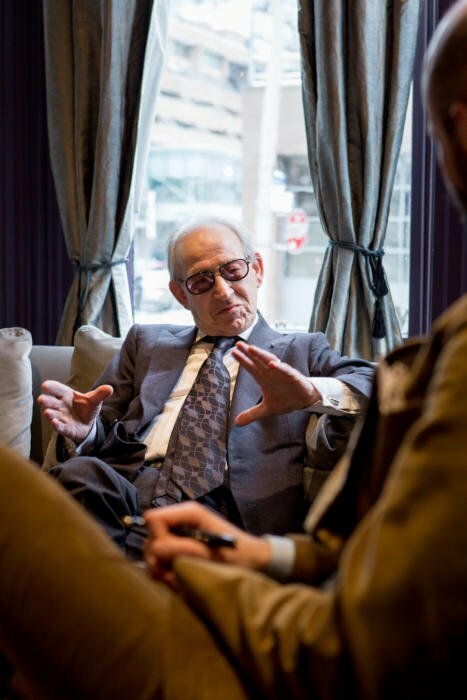 He became one of the last true bespoke tailors in Canada. That experience of working on his own, without an experienced bespoke clientele, has influenced some of Signor’s style and practices. It has made him particularly flexible on speed, for example. I had a jacket made (a DB in the same brown donegal as my Dalcuore) which Signor finished without a fitting. 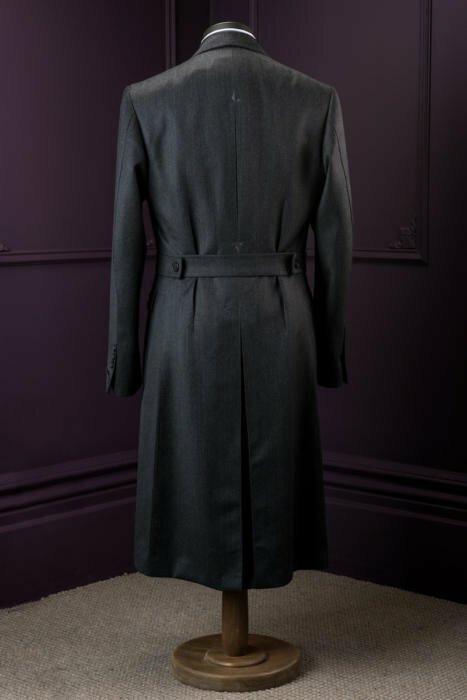 There was some miscommunication there - I would have preferred at least one fitting - but when I returned to Toronto to try the finished jacket, Signor made several alterations to fit and length in less than an hour, in order to give it to me to take away. It has also given him a full toolbox of handmade details - which are often easier selling points for those not used to the subtleties of bespoke. You can see those in the various images here: lap seams, inset fabric, Milanese buttonholes, and box pleats with hand-sewn sprat’s heads. He also has the experience to work with a very broad range of materials, such as silks and denim. Some of these details will attract bespoke customers looking for something unusual (and they are certainly well-executed). Others may be a little over the top - and if there is anything I would say doesn’t appeal to me, it is these style aspects of Signor’s work. I’m undecided on the lapel line on the DBs, for example, which has a little belly to start with, before straightening and actually curving subtly outwards at the point. These are subjective points of course, and can also be changed. But I have always recommended buying into a tailor’s style - one you can see, and try on - rather than trying to create something different. I’ll post pictures in a few weeks of the final jacket. The fit was good, if not perfect - but then it is based on the experience of having almost one fitting, rather than the normal minimum of two. I’ve been meaning to write about Signor for a while, but was spurred to do so this week as readers in New York will have the opportunity to see him when he comes to the city on February 13th. Signor will be hosted in the Saint Crispin’s showroom (130 W. 57th Street, Suite 11A, New York) from Feb 13th to 15th, along with Marol shirts. Contact is through email info@francescosr.com or events@leatherfoot.com - or telephone +1 (212) 804-8255. Signor plans to return 2-3 weeks later for fittings, and then again once more, another 2-3 weeks after that. So delivery in around 8-10 weeks. Prices for two-piece suits start at $6200, sport coats $5000 and trousers $1200 (tax included). All details, as ever, are on the Permanent Style trunk show calendar. You can follow the discussion on Signor Francesco: bespoke tailor, Toronto by entering your email address in the box below. You will then receive an email every time a new comment is added. These will also contain a link to a page where you can stop the alerts, and remove all of your related data from the site. Hi Simon, you often spend a lot of time discussing the shape, roll and size of lapels, button position, drape and other aspects seen on the front of a jacket. One of the aspects I like in a well tailored garment is the shape of the back of the jacket. Many just ‘hang’ down from the shoulders rather than showing the sculpted shape often preferred by tailors on ‘The Row’ which emphasise shoulder width, tapering into the waist to achieve a more ‘powerful’, masculine shape. I am regularly shocked to see well made jackets/suits which look great from the front are very often sad and shapeless from behind. Surely a good tailor will work as hard crafting the back of a jacket as the back? As you have much more experience than I do using different tailors I would be interested to hear how much time you spend looking at the back of your garments during fittings? It’s a good point. I would argue the front is always more important, but great fit does make a big difference to how the back looks – and of course any side profile. I do spend a fair bit of time in any fitting process looking at the back, and there are two key areas here: how tight you want the back (a question of cleanliness versus comfort) and how much suppression you have through the waist (more gives nice shape, but does mean the tail is more prominent as goes over the seat). Having a relatively slim waist and large seat, the latter is an issue I have discussed fairly regularly on posts on fittings. You may have come across some already. I was wondering the same thing, thanks for clarifying! Given this, I can’t help feeling his prices are exceedingly high (as I’ve also found with New York based tailors.) For the same amount you could get a suit from Cifonelli or Chittleborough & Morgan (almost!) and could get two suits from one of the many traveling Neapolitan tailors. Would you really say the quality is enough to merit this price point? I am familiar with Cifonelli as well as the majority of Saville Row tailors and I can assure you that, having worn Francesco’s suits, they don’t compare in craftsmanship, and quality. While others may be better known ‘labels’, I have long refused to pay that kind of money for tailors who cannot offer the level of tailoring versatility you speak of, artisanship, and more importantly, freedom of movement that a Francesco jacket offers. Worth every dollar. Thanks William. If you can be specific at all on what you mean by craftsmanship and quality that would be great. Toronto still has a number of Italian tailors in their 70’s who apprenticed in Italy in their early teens and then later emigrated to Canada. One such is Antonio Incerto of the House of Antonio and Charles who for many years was the tailor for all of the equestrian apparel for several local hunt clubs and the Royal Winter Fair equestrian events. 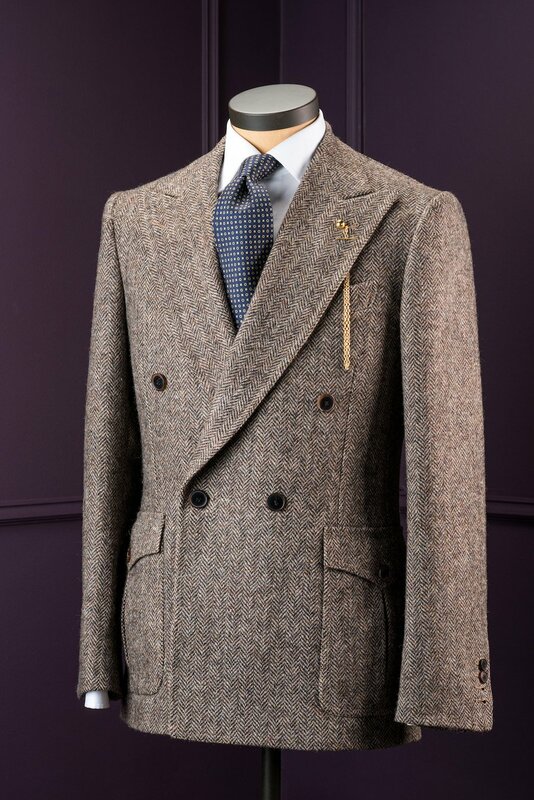 His house style is equal in many ways to traditional Savile Row tailors at considerably lower price. http://www.antonioandcharles.com The website is a bit dated as are the prices listed. Regular garments rather than equestrian are now his mainstay due to a decrease in the popularity of hunting. With regard to price, as a repeat client, he is gracious enough to offer me a discount. A year ago he made a navy twill blazer for me and the cost was about $1000 CAD (tax included) with me supplying the cloth. Would it be undiplomatic to name a tailor? It depends a huge amount on where I worked etc and what I needed it for, but it would be a navy SB 13oz worsted. Naming a tailor is not undiplomatic, it’s just a very big question about style, budget etc. There are perhaps 500 posts on this site on that question! Thank you for featuring this tailor. Just think that in one article over 400,000 readers are now aware of him and his work! The examples above are superb; showing craft, flair and creativity. The cutting seems exceptional and I must demur re. the DB lapels, they seem very fine in shape, especially the grey DB. More than this though is the Italian sense of style reminiscent of Rubinacci (esp. the tweed blazer). You mention a number of tailoring features (hand sewn sprats etc.) if possible could you broaden this out into an article (with images), I’m sure readers would be keen to learn something more on this subject. Thanks for this report. 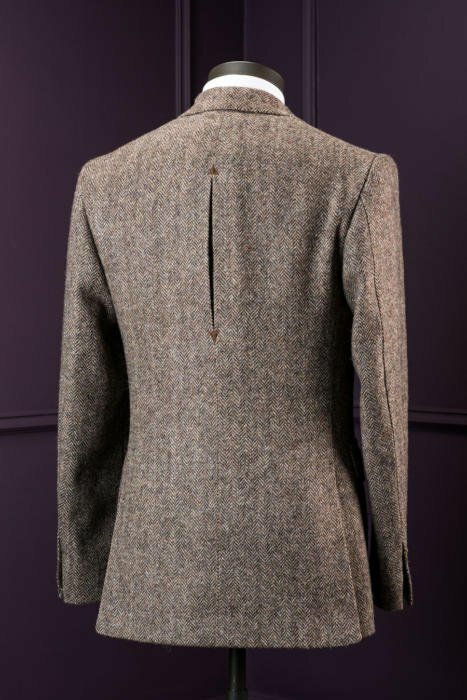 Please, could you tell us whether the pleat on the back of the last jacket is a matter of style or rather does merely perform a technical function? And if it’s a matter of style, could a jacket or a coat be designed without such a pleat or the usual seam and nonetheless properly fit? It could certainly not have that pleat and fit properly. 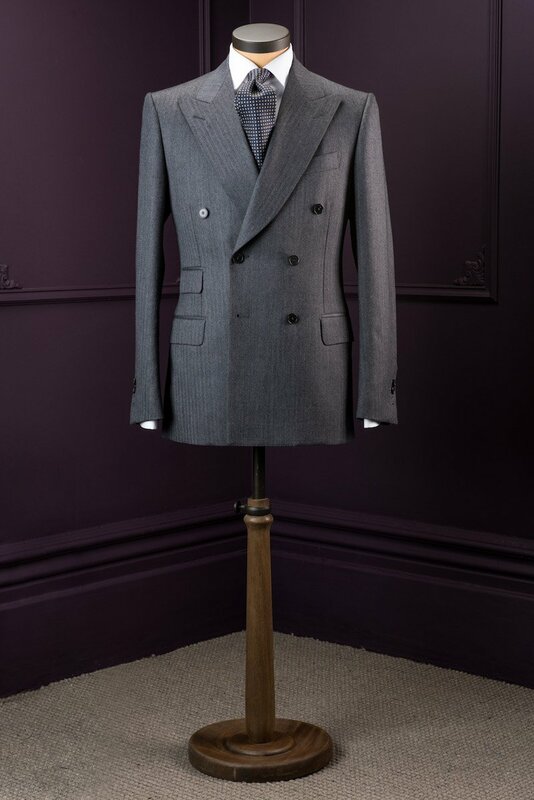 Yet the jacket of your Chittleborough & Morgan suit fits well, whereas the seam on its back isn’t a real one. It only mimics regular ones. I confess that I’m a bit puzzled! That is a real seam. But the important point is not the fit; it is the movement. And you cannot tell how much movement there is in a jacket from looking at static photos. What you’ve pictured looks superb, love the details, & the lapels in particular…obviously the style aspects are subjective but would seem if they didn’t appeal then try another tailor. Wouldn’t have minded some info on the garments you’ve pictured rather than just providing decorative appeal. Good point. These are the standard ones LeatherFoot has, but I can certainly ask for cloth and product detail. Loved the video on Francesco’s style and interesting that he still retains a strong Italian accent even after 40 years in Canada! In the video, i notice on his son’s jacket that the shoulder seem slopes backwards – i have seen this elsewhere as well. Doesn’t this make it harder to control shape around the neck? As the natural pull of the shoulder seam will be pulling the jacket backwards? I have no doubt his prices have rocketed into absurdity since he became roofed by LeatherFoot. I can assure you that no Canadian prime minister, no opposition leader nor Mr. Shatner have been splurging on US$6200 suits made in Toronto! I’m not one for absolute statements or conjectures without supporting evidence. For one price and value is very subjective to the individual; having seen, handled, and tried on his garments the craftsmanship compares favourably to the likes of Kiton and Brioni that are more expensive. People with more experience with different bespoke tailors also speak highly of his work, in particular how the jackets and coats have structure to them but are so soft when you wear them. As I am not privy to the finances of the Canadian PM, opposition leader, or William Shatner or the book of clients of Signor I can’t and won’t conclusively say that they have or have not been commissioning from them. Unless you are privy to such information it would seem to be a disservice to the community to state such things in a manner that presents them as facts. Thanks Allan, that’s useful. Kiton and Brioni are perhaps not good comparisons, but other softish tailors like Caraceni or Cifonelli would be. I will, of course, talk from that viewpoint when I review my jacket. prices are silly. SGR has been around for a very long time and has had several homes. The reputation has always been copius amounts of handwork but less than stellar on the fitting. I tip my hat to him though he has never been bashfull about setting his prices high. i do find it amusing that the young chaps behind him want to montize their investment my taking him on the road. Seems a little long in the tooth for that. Can’t agree more on your comment. I’m sure any experienced tailor in Naples would charge a lot less(including flight fares round trip), which you will have real southern Italian style rather thanthe funny lapels style in Toronto. Signor Francesco is an artisan and true master of his art. Some of my best and favourite comes from him. Always a pleasure visiting his shop. Thank you for this great article about a Toronto bespoke legend. Fantastic videos and story describing the rich history of Signor Francesco fashion and design. They really capture the essence of Signor Francesco. I’ve always been a fan of his work and always pleasantly surprised by the quality. Looking forward for more to come! I was wondering can a full canvassed suit still contain fusing in its construction? Does the pinch test apply for knowing wether the canvas is fused or sewen?